Schwarzwälder Kirschtorte is the traditional dessert of southern Germany. 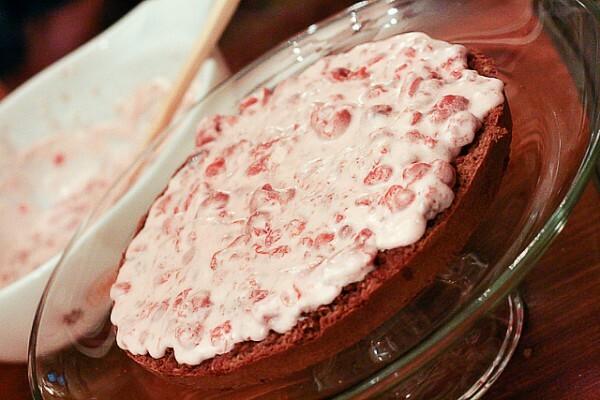 Literally, it means “black forest cherry torte,” and it consists of whipped cream and cherries between layers of dark chocolate cake. 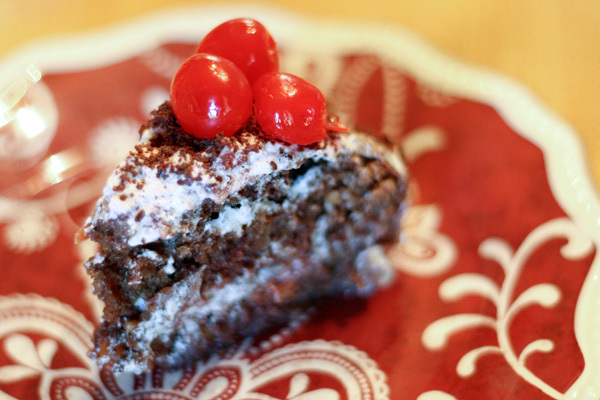 Kirschwasser (a clear liquor distilled from tart cherries) is often added, and the cake is typically decorated with chocolate shavings and maraschino cherries. Obviously we had to serve this following wienerschnitzel and homemade spätzle on Saturday night. This recipe comes from a 28-year-old German cookbook that was given to us by Nick’s mother. (Thanks, Mom Wiley!) The cake is not complicated, but it does include techniques I’ve not tried before. 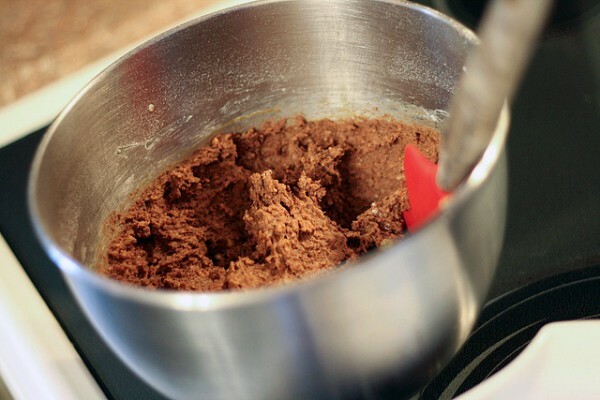 First, it uses shaved bars of dark chocolate rather than cocoa powder. It also includes almonds, which next time, I will toast first and ground more. After combining the butter, sugar, egg yolks, vanilla, dark chocolate, almonds, and flour, the whipped egg whites are gently folded in to produce a sticky, dense batter. Next, we could not find Kirsch at the liquor store, so we substituted a cherry wine. It was sweet and tasty, but likely did not produce as powerful of a punch as intended. Overall, I’m glad we attempted this dessert, but I do need to make some alterations and try again to really pay homage to this classic German cake. Cream the butter and gradually add the sugar and egg yolks. The mixture should be light and frothy. Add the vanilla, chocolate, almonds, and flour. Then fold in the egg whites. Pour the mixture into a butter and floured springform pan. Bake for 45 minutes to 1 hour. Cool for a few minutes, then remove the cake from the pan. When completely cool, cut the cake horizontally into 2 (or 3) slices. 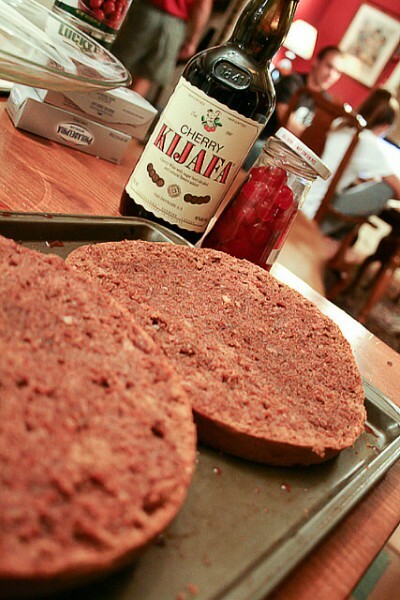 Mix the Kirsch and cherry syrup together and pour onto the cakes. For the filling and topping, whip together the cream, sugar, and Kirsch. Fold in the cherries. Spread each layer evenly with the whipped cream mixture and assemble the cake. Spread the top and sides with the remaining cream. Sprinkle with dark chocolate (curls or shreds) and top with cherries. As a German, I will allow myself to reply here (which is hopefully fine with you, Emily) – yes, Schwarzwälderkirschtorte is way more authentical than any kind of German Chocolate Cake. I do love German Chocolate Cake, but the recipe isn’t included in either of my “traditional” German cookbooks! Of course! And thanks for commenting!